Need flower delivery to Limerick? Bloom Magic Flowers have you covered. We are dedicated to delivering luxury bouquets for any occasion with the highest standard of care. This ensures our lavish flower arrangements arrive in absolute perfect condition. For next-day delivery on any weekday to Limerick, order from our online catalogue by 3pm. This means your gift will arrive just in time to surprise your loved one on their special day. Obviously, you don’t have to wait ‘til the last minute to arrange for a flower delivery to Limerick. When placing your order, take a look at our full calendar to pick and choose the date of delivery. You can choose any week day for your delivery, weeks in advance. Next-day delivery, and deliveries days or weeks in advance, are charged our standard rate of €6. If you plan on using Bloom Magic services repeatedly throughout the year, why not sign up to our Gold Club? You can get free standard delivery for a period of 12 months for only €15. At Bloom Magic, we cater to a wide range of occasions. From Wedding Flowers to New Baby Flowers and everything in between – we are devoted to making every milestone, celebration and occasion even more special with our carefully selected bouquets and gifts. You can make each flower delivery a little bit more special by adding an elegant vase, ordering a premium bouquet with more flowers or by adding a scrumptious box of chocolates. Sometimes the best time to send a floral gift is when you do not have a reason to send one at all. This is why we offer our “Just Because” selection of bouquets. 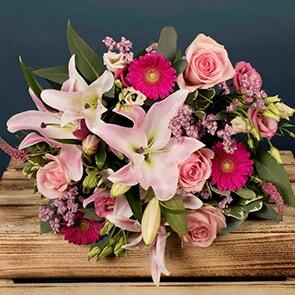 Surprise someone with a lovely potted orchid plant or send someone our Imogen Bouquet – a stunning selection of roses, tulips, lisianthus, gerbera & freesia. It will certainly brighten up their home and their day! We also have a wide selection of flowers for other occasions, such as Wedding Flowers – an ideal way to send a couple your congratulations on their big day. Let them know you are thinking of them with our Magical Lilies Bouquet – a truly magnificent bouquet of oriental lilies and green foliage. Or, send them one of our gift sets, such as the Rêverie à Saint-Germain gift set – not only does this include a bouquet of flowers, it also comes with a bottle of Italian prosecco and a box of delicious chocolates. Our Flower delivery to Limerick includes the following areas: Abbeyfeale, Adare, Askeaton, Bruff, Castleconnell, Foynes, Kilfinane, Kilmallock, Limerick City, Murroe, Newcastle West & Rathkeale.